People cannot get enough of playing Dragon Quest games. You can save as much as 60% discount when you buy from Amazon, Simply Games, and other UK sellers. Our team of community bargain hunters has listed the latest Dragon-Quest deals and promotions you may want to check out. Here is where you can find limited and the most awesome deals online. Get big savings and you have the option to use the money that you have saved to buy more games. Get access to the most affordable games that you are looking for. Get fantastic money off on Dragon Quest games with the help of Latest Deals! Yuji Horri in partnership with Armor Project, created Dragon Quest or Dragon Warrior - a Japanese role-playing video game on 2005. Square Enix published the game that even had its localised version. These versions were seen on various platforms such as Nintendo DS and 3DS. This has become well-known. As a matter of fact, there is a good number of animes, novels and mangas released under Dragon Quest. On top of this, there are also related adaptations noted which proves how famous this game is all over the world. There is only a simple premise in the Dragon Quest. Basically, you have to be a hero who is destined to save a land from peril because of evil enemies. The group is accompanied by its party members. Throughout the game, you can expect to see turn-based combat, Slime, recurring monsters and many other random encounters. These are all present in the series. Dragon Quest has maintained its development team from 1980. There may be modifications but the origin is still present. Hence, explains the presence of its spinoffs available on various platforms. As you may have known, Dragon Quest is a role-playing game that has its spinoffs. Its setting is the medieval-fantasy which features turn-based combat. It holds the record of being the longest-running game franchise all over the world. It has surpassed its counterpart, Final Fantasy with more than a year. For three decades, Yuji Horri stayed with the creation and design of Dragon Quest. It served as an amalgamation of Ultima and Wizardry - two long-running WRPG franchises. This has gone from the mid-late 1980s to 1990s. The goal of the developer was to introduce the RPG genre to the majority of the Japanese audience. This pushed the release of the game on the Nintendo Famicom. 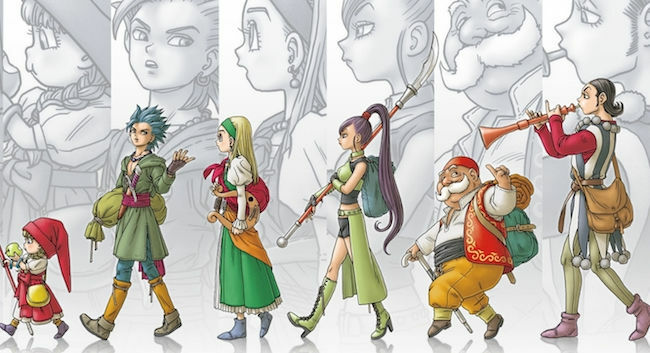 During the release of Dragon Quest, there were questions about its purpose - as to whether it will be embraced by the masses. Before, the swords and sorcery image was not yet popular. However, the game has reached sales expectations so these issues were debunked right away. The Dragon Quest experience is like no other. Young people may have a hard time appreciating it at first, but it would eventually grow on you. This game was carefully built. It is not frontloaded nor backloaded. It is balanced and exciting. For sure, it will take a dozen hour of your time. The game is reminiscent of the traditional Japanese theatre. You will be able to unfold it with its swashbuckling video game adventure. Simple yet elegant, it is humorous and tragic all at the same time. Most of the games of Dragon Quest are connected with one another. It is not a requirement that you start on the first two games. This is not recommended. You may even find the original version way too simple. You just jump into it when there is a chance. Among the series, the most highly recommended is the Dragon Quest III. This is straightforward. You can get caught up with the game right away. However, this may ask for customisation. Once the game starts, you would have to build an assembly of adventurers. Afterwards, there would be sprawling and a charming journey as well that would be a preview of what Dragon Quest has to offer. What should you remember in venturing to this game? Explore Dragon Quest IV. This can be a good start to keep you going. The episodic nature of this is somehow more acceptable to a majority of players. Chapter IV is made up of long hours of control and play. Aside from this, you can also try Dragon Quest V. This is the best avenue most especially if you are at ease with Dragon Quest III. If you are disappointed with the old-school graphics of Dragon Quest, you can begin with Dragon Quest VIII. This is less complicated which is quite a good thing. This is said to be the most appealing Dragon Quest game. You only have to be ready because this is long. Once you already know what Dragon Quest is all about, you will opt for the more advanced presentation for sure. This goes beyond the basics. It is rich that handles the Dragon Quest III version very well. Indeed, this character customisation is one of its kind. It can be forced multiple job paths that retain skills even if you switch to a new one. Gather sparkly spots on the map. Do not focus much on the camera. Avoid activating the Dracorian Settings just whenever you please. There are plenty of ways to save on your purchases online. 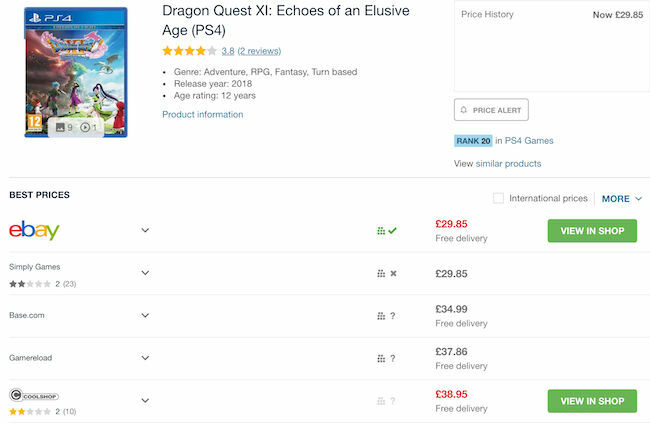 Most online UK shops such as Amazon, Base & Coolshop have regular sales, seasonal clearance, and flash sales where you can get up to 50% off on a wide array of Dragon Quest games. There are even retailers that have 3 for 2 and 2 for 1 offers on select items. Also, the best time to get huge savings is during Black Friday, Cyber Monday, and Boxing Day where an extensive selection of products like Dragon Quest XI PC, Dragon Quest VIII, Dragon Quest XI, and Dragon Quest IX from your favourite UK retailers are reduced to clear. Knowing when and where to look for the lowest possible price on video games and console bundles such as Dragon Quest PS4, Dragon Quest XI Nintendo Switch or Dragon Quest VIII 3DS is the key here. Fortunately, you don't have to spend hours online searching for special offers, bargain deals, and price drops on Dragon Quest games. Our massive community of bargain hunters regularly share verified discounts, promos, and voucher codes from eBay, Gameseek & Music Magpie, and from other reputable shops across the country. We also have a team of money-saving experts who always share essential tips and tricks on how you can get every day low prices on Dragon Quest Rivals when shopping both online and instore. Getting additional money off with the help of Latest Deals is easy. You can maximise your savings by simply using the latest Dragon Quest discount code of your choice upon check out. There are also voucher codes that can provide you with free shipping and gifts.